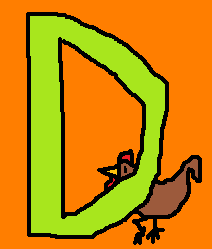 Well, here we have D. It is pretty basic. I had a bit of trouble with the curve of the D for some reason. Overall, it's pretty basic with the chicken peering through. Also you may notice that I'm participating in Blog Action Day 2009. Don't worry too much. It will have the proper amount of this site. It'll also have some not this site in it. I won't scare them or you. Don't worry.